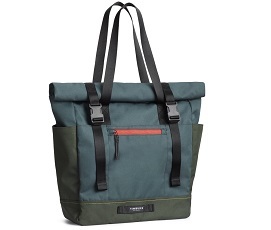 Timbuk2 makes stylish, comfortable and durable bags that are literally built to last a lifetime and are as ideal for everyday use as on a bike ride. The brand is committed to designing extremely long-lasting products that enable freedom for the digital nomad about town, the cyclist or commuter. On the Addnature.co.uk website, there is a wide selection of Timbuk2 bags including its portfolio of backpacks, messenger bags, tote bags, travel luggage and bike panniers. Timbuk2’s history began in 1989 when Rob Honeycutt, a bike dealer in San Francisco, made a shoulder bag for cyclists and bike messengers. He was inspired by his studies of Toyota’s Lean Production System to create a custom-made bag that minimised waste, while still allowing for a quick turnaround during production. Timbuk2 bags and messenger bags are exceptionally durable and are as useful for every day practical use as they are for use by cyclists and couriers. Many of the models are especially suited for cycling, but there is also a line of regular shoulder bags as well as bags that work well for laptops and backpacks. At the Timbuk2 headquarters in San Francisco, the dedicated small team work together to manufacture “last-a-lifetime” bags in different colour combinations that have been selected and ordered by their customers. As the interest in their products is high, they also make some of their non-custom products in Asia, in Indonesia and Vietnam, to meet global demands. Additionally, Timbuk2 is a very environmentally conscious company. Its bags are made to last a lifetime and it works with local talent and keep a lot of the manufacturing process local to support American workers and lower shipping costs. Timbuk2 recycles older bags that are returned by its customers or it repairs the bags and returns them. At the office, every employee is provided with recycling bins at their desk and is encouraged to cycle to work by the provided inside parking, loaner bikes and bikeshare schemes, on-site showers and a pre-tax monthly stipend for cyclists.